Welcome to Charter Everything Inc.! We are America’s premier charter bus & executive transportation company, serving Durham, Raleigh, Cary, Chapel Hill, and neighboring North Carolina areas with exceptional customer services in the bus industry. When it comes to group transportation, Charter Everything is a name synonymous with professional services, uncompromised safety, and unmatched reliability. we have established ourselves as the best charter bus rental solution in the United States. Our extensive fleet of world-class vehicles, experienced drivers, modern on-board comforts, and unparalleled punctuality are orchestrated to enhance convenience and efficiency for every passenger. 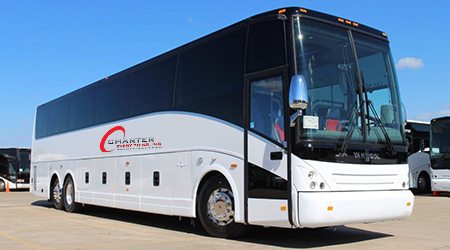 Charter Everything Inc. is nationwide acclaimed for its vast selection of luxury charter buses and executive transportation solutions. We have just the right kind of vehicle that fits ANY group size, ANY requirements, and ANY budget. What makes us stand out in the competition is our dedication to offer the highest standards of comfort and safety to our passengers. Our vehicles are equipped with high-end facilities such as sanitized restrooms, reclining leather seats, Wi-Fi connectivity, power outlets, world-class media, A.C. and heating system, LED television, and much more. Our fleet comprises of vehicles with a wide range of different passenger capacities. We offer executive transportation services via our colossal deluxe motor coaches that can comfortably accommodate up to 56 passengers. These are perfect for corporate events, sports teams, weddings, or any event that requires group transportation in bulk. For smaller group sizes, we have luxury mini bus rentals with a max passenger capacity up to 38. You can also choose from our meticulous selection of private party buses, school buses, sprinter vans, and lavish limousines. For you next big event, contact us today, and our expert professionals will help you pick the right vehicle that fits your preferences and budget. Already have a trip planned for your upcoming event, and now need safe & trustworthy transportation service? 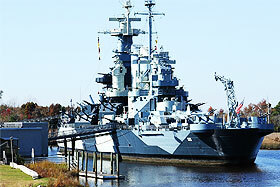 Our team will review your itinerary, and likewise, design the best group travel solution in North Carolina. Whether dealing with high-end corporate groups, sports teams, family sightseeing tours, school students, or night out for a young group, we know how to keep up to your expectations and handle all the logistics of ground transportation seamlessly. Conventions & Meetings: North Carolina is a thriving business hub, and also a popular tourist destination in the United States. If you are planning to organize your next business meeting, convention, or corporate tour in NC, count on us for superior group transportation solutions. We have been a leader in corporate charter bus rental services for over a decade, and we know your expectations regarding comfort, class, punctuality, and professionalism. We provide point-to-point pickup and drop-off service when required, airport & hotel shuttles, and also cross-state transportation for your corporate group. Whatever the group size, we have just the perfect vehicle for you. Our vehicles are also equipped with LED television, Wi-Fi, electrical outlets, and DVD players to let you work & stay connected on the go. For more details, give us a call today. Weddings: With Charter Everything, transportation should be the last thing on your mind for your big day. 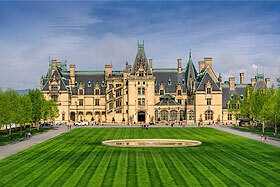 Entrust us with the hassle of arranging guest transportation from anywhere in North Carolina. We will pick up your guests from the airport, drop them to their hotels, and transfer them to the wedding venue in a stress-free and comfortable manner. We also provide sprinter vans, mini buses, and limousines to transfer you and your wedding party to the venue. It will be a sight to behold when your guests and wedding party will reach the destination in absolute style & sophistication. Equipped with modern amenities, traveling in one of our deluxe motor coaches is also an experience that your guests will cherish forever. Educational Tours: We understand how challenging it can be to arrange a educational student tours for school & university students. Transporting students in groups and in a safe & reliable manner is the foremost priority here at Charter Everything. 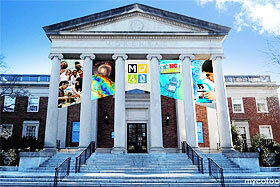 At the same time, you would like to consider what is the most affordable options for your students. With Charter Every Thing, you can forget about the hassle of arranging group transportation for your upcoming educational tour. We have special private buses with many different passenger capacities, and you can choose one that best fits your group size. When traveling with students, safety is our top concern. We’ll ensure the vehicles are properly maintained; our drivers and other staff undergo strict background screening; all our vehicles are fully insured. So you can be assured of matchless comfort & security with Charter Everything. 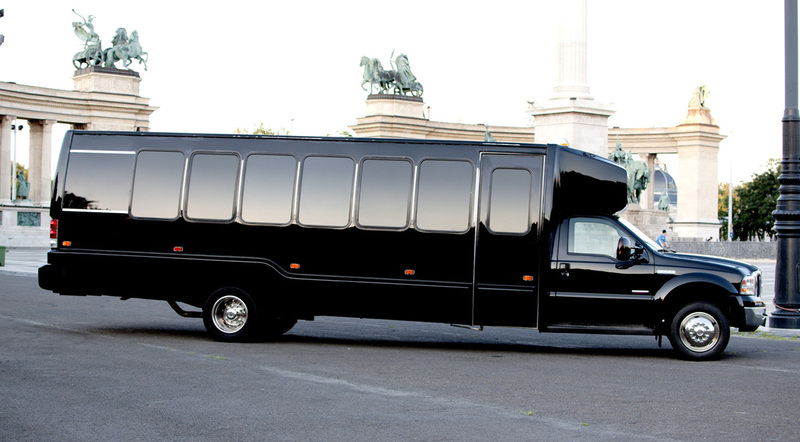 Events: When you organize an event, the responsibility of guest transportation lies with you. When you partner with us, it is the last hassle that you should be concerned of. We provide timely and high quality charter bus rental service for trade shows, exhibitions, sporting events, school prom nights, and any other event held in North Carolina. We have the finest fleet of luxury vehicles, personalized services, and industry-leading safety standards to deliver you the best of group transportation. Sightseeing in North Carolina: With splendid outdoor activities, theme parks, museums, and natural wonders in offer, sightseeing in North Carolina is an experience to treasure forever. On one hand, the pristine beaches allure you for a relaxing weekend holiday; on the other hand, the mountains call for amazing skiing and hiking opportunities. And as a perfect icing on the cake, you have numerous historical attractions that make North Carolina sightseeing an enchanting experience. If you are planning a delightful family tour of this beautiful state, choose us for top quality transportation services. Depending on your preferences, group size and budget, we will craft an itinerary that precisely meets your requirements. We will provide you with a luxury charter buses, equipped with modern comforts to ensure a memorable sojourn. From airport pick-ups, hotel shuttles to cross-state transportation, we offer the most convenient travel solution for all our passengers. Let’s get started, and you will feel the difference! So what are you waiting for? Get on board with Charter Everything, and have the most comfortable transportation experience right away.